In my 19 years teaching from grades 2 to grade 8, I’ve had many experiences with students and their cell phones. When cell phones first became popular with students, I was waiting for administration to outline rules on how to appropriately deal with cell phones at school. This took a while as education policy is always playing catch up with the practice of education. In middle school, students felt that they could use their phones whichever way they wanted. Students took pictures of themselves and other students and sometimes gross things in toilets. Students also watched videos and looked at pictures, while pretending to do school work. One time I saw a male grade 8 student looking down with his hands under his desk … always a bad sign regardless of the age of the student. I discovered he was looking at pictures of basketball players. I asked him to show me the pictures which turned out to be pictures of basketball, basketball, and then a half naked girl, repeated. I had no procedure to deal with his cell phone so I asked him to put it in my locked desk drawer until class ended. I told administration what had happened and never heard about the resultant consequences. In my middle school, we had students use cell phones to bully others and to record teachers. Once, a student handed me her cell phone stating that her mother wanted to talk to me about her math test in the middle of a fractions’ lesson. Policing cell phone use is like policing gum chewing – It’s a game of “Wack-A-Mole”, you catch one and another one shows up. When cell phones and devices became part of BYOD – Bring Your Own Device to school, I believe this was an attempt to fill in the gap in available technology. What this did do is highlight the digital divide between students whose families could afford to buy cell phones and devices for their children, and those who could not. Rich vs. Poor, Haves vs. Havenots – I witnessed the presence of cell phones and tablets dividing students along socioeconomic lines. As a classroom teacher, in the last few years, I’ve asked students to keep their cell phones at home or in their locker. I was able to do this because my students’ parents either could not afford phones or they were in grade 3 and too young to have one. In the current special education classroom I teach, we have solid access to technology and have no need for additional devices. I am fortunate, but not all teachers have this access to technology. Last week, While celebrating his birthday, my partner and I went to a small Mediterranean restaurant. As we had no reservations, we had to wait a while to be seated. While waiting, I observed the occupants of the 60 seat restaurant. I counted 12 children, aged about 2 to 10 years old, in the restaurant. To my dismay, I noticed that all the children were quietly immersed in their cell phones. The children were not engaging with their peers or the adults. The two year old was being fed by her mother while she watched a cartoon video. I also observed many couples staring at their phones instead of talking to each other. This meant that a third of the restaurant patrons were there but “not present”. The observation of these children, all on their cell phones struck me – these children were not engaging socially with adults or their peers. The parents of these children were using these devices to keep the children quiet so they could have dinner, in peace. I get this. 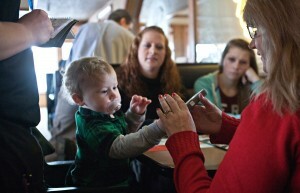 If parents use cell phones as babysitters, then they do not have to hire a babysitter to go out for dinner. What also struck me is that there may be a correlation between cell phone/device use and children’s inability to wait and calm themselves. Talk to teachers and they will tell you they’ve noticed an increase in students’ ability to self-regulate and self-calm. Several peer-reviewed studies outline challenges with children and cell phone use. Studies have shown that cell phone use can negatively impact children’s ability to self–regulate emotions (Elhai et. al., 2018). In 2015, the Journal of Pediatrics commentary “warned that using a tablet or cell phone to divert a child’s attention could be detrimental to “internal mechanisms of self-regulation” (Walters, 2015).”If these devices become the predominant method to calm and distract young children, will they be able to develop their own internal mechanisms of self-regulation?” (Radesky, Silverstein, Zuckerman, & Christakis, 2014, p. 1). “It has been well-studied that increased television time decreases a child’s development of language and social skills. Mobile media use similarly replaces the amount of time spent engaging in direct human-human interaction,” Walters (2015) citing Jenny Radesky, clinical instructor in Developmental-Behavioural Pediatrics at Boston University School of Medicine. Cell phone use in children has been linked to lower self-esteem and technology addiction (Bianchi & Phillips, 2005). Another study states that use of internet and cell phone use negatively impacts emotional, cognitive, and physical states in adolescences including dependency and addiction (Cheever, Moreno & Rosen, 2018). Cell phone use increases distractibility and undermines the benefits of social interactions in families (Dwyer, Kushlev, & Dunn, 2018). Access to social media and cell phone use also negatively impacts body image and academic achievement (Felisoni, & Godoi, 2018) as well as increases bullying and cyberbullying (Bryant, 2018). Banning cell phones in schools is not going to work. Cell phones and tablets have become engrained in schools, not as just communication devices, but as learning tools. Yesterday, I witnessed some grade 8 boys, working together, recording a script for social studies using a cell phone. What I am proposing is to teach children how to use cell phones in appropriate ways. This means that in teaching children, parents must take the lead in teaching their own children how to use technology. Overwhelmed with socializing children, schools cannot take on yet another task. Monitor children’s use of technology by putting limits on access. A recent study suggests that screen time should be limited to 2 hours a day (Dormehl, 2018). If Steve Jobs and Bill Gates limited their children’s screen time, it’s probably a good idea. Practice what you preach. Parents are the ultimate role models for their children. If children see parents using their technology all the time, children will follow in their parents’ footsteps. Know the risks of children’s use of technology. Technology impacts how children interact with the world. It could even impact mental wellness and academic achievement. Instead of cell phones and devices, teach children how to interact with their peers and adults. Teach children how to calm themselves by letting them learn through dealing with frustration. Do not use technology as a babysitter. Children need to learn how to wait and occupy themselves. Children need to interact with others. Keep discussions open about cyberbullying and privacy issues. Teach children about Internet “stranger danger”. Coach children to keep personal information private. Teach children the difference between Internet friends and real friends. Finally, children do not need to have a cell phone in class. Nor do children need to have parents call or text them while they are at school and especially when they are in class. If it is an emergency, parents should call the school instead. Be present with children. Spend face-to-face time with children. Plan special family time without the Internet or technology. Be present with yourself and others. Bianchi, A., & Phillips, J. G. (2005). Psychological predictors of problem mobile phone use. CyberPsychology & Behavior, 8(1), 39-51. Bryant, A. (2018). The Effect of Social Media on the Physical, Social Emotional, and Cognitive Development of Adolescents. Cheever, N. A., Moreno, M. A., & Rosen, L. D. (2018). When Does Internet and Smartphone Use Become a Problem? Technology and Adolescent Mental Health (pp. 121-131). Dwyer, R. J., Kushlev, K., & Dunn, E. W. (2018). Smartphone use undermines enjoyment of face-to-face social interactions. Journal of Experimental Social Psychology, 78, 233-239. Elhai, J. D., Tiamiyu, M. F., Weeks, J. W., Levine, J. C., Picard, K. J., & Hall, B. J. (2018). Depression and emotion regulation predict objective smartphone use measured over one week. Personality and Individual Differences, 133, 21-28. Galetzka, C. (2017). Commentary: Mobile and Interactive Media Use by Young Children: The Good, the Bad, and the Unknown. Frontiers in psychology, 8, 461. Radesky, J. S., Silverstein, M., Zuckerman, B., & Christakis, D. A. (2014). Infant self-regulation and early childhood media exposure. Pediatrics, peds-2013. Swain, S. K., Behera, I. C., Sahu, M. C., & Choudhury, J. (2018). Mobile phone use among children and its impact on hearing: Our experience at a tertiary care teaching hospital. Pediatria Polska-Polish Journal of Paediatrics, 2018(2), 117-120.